Friday marks the 90th anniversary of the reading of the Riot Act in Glasgow's George Square - the last time it happened in the UK - at the height of discontent over rising unemployment. Writing for the BBC Scotland news website, sociologist Dr Seán Damer examines the legacy of the events. The riot known as "Bloody Friday" has its anniversary on 31 January. Given that the government of the day feared that revolution was about to erupt on the streets of Glasgow, it is curious that this dramatic incident is now all but hidden from history. To make sense of the riot, it is necessary to remember three vital contemporary issues. The first was that World War I produced an insatiable demand for munitions, with the result that the Clyde was turned into one enormous armaments factory with a hugely expanded workforce. Before the war, the engineers' normal working week was 54 hours, with a 0600 start and 1730 finish - noon on Saturdays. The 0600 start was a killer as many had long journeys to their workplace; the engineers had long aspired to a shorter working day. So they exercised their muscle in wartime to demand better wages and conditions. The Clyde Workers Committee (CWC), an informal but wide-ranging network of shop stewards, was formed in 1915 to defend workers' interests, further their industrial demands, and for some of them, oppose the war. The second issue was the nature of the Clydeside Independent Labour Party (ILP). This was a reformist socialist party, but a radical one, which subtended a loose but formidable political network, reaching into all areas of working class life outside the workplace. The ILP was in close touch with the CWC, and many members of the latter committee were in fact party members. This combination of industrial and civil clout gave the Clydeside working class movement both a socialist political culture, and self-confidence, unique in contemporary Britain. The third issue was the spectre of the Russian Revolution of October 1917, and the Spartacist Revolution in Germany which had started in November 1918. In 2009, it is hard to comprehend the fear and loathing with which the British Government perceived these events. But an insight into the attitudes of the contemporary ruling-class can readily be gained by reading the leader columns of the Glasgow Herald. The class hatred they demonstrate towards the Clydeside working-class movement is unrepentant. The language is intemperate to a degree, and phrases like "Bolshevist scum" and "Spartacist rabble-rousers" frequent. In January 1919, the CWC decided that they would demand a 40-hour working week, and called a strike to put pressure on the government. The CWC's argument that shortening the working week would result in an increasing demand for labour, and thus mop up some of the thousands of demobbed servicemen, was a sensible one. The strike started on Monday 27 January, and soon 70,000 workers were out. On Wednesday 29 January, a CWC deputation went to Glasgow's City Chambers to ask the Lord Provost to put their demand to the government. Note that they went to the City Chambers. They did not build barricades, they did not try to seize guns from the military, and they did not try and persuade the soldiers in Maryhill Barracks to join them. However, they left the lord provost in no doubt that "drastic action" would be taken if their demand was not met. But there is no evidence that anything but more aggressive flying pickets was contemplated. It was all a game of bluff and double-bluff. The Cabinet reacted with what can only be called paranoia. 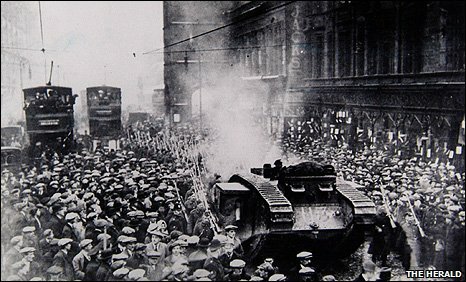 It decided to deploy troops, an informal committee was established to deal with unrest, a special representative was sent to Glasgow to liaise with the lord provost and sheriff, plans were made to arrest 40-hour strike leaders, troops were deployed, and six tanks and 100 lorries sent north by train. The seriousness of the government's intent can be gauged from Regulation 965 about how to deal with 'civil unrest': "It is undesirable that firing should take place over the heads of the rioters or that blank ammunition should be used." On the morning of Friday 31 January, 1919, the strikers marched to George Square, carrying a large red flag as usual, to hear the lord provost deliver the government's response to their 40-hour demand. However, that response had already been printed in the first edition of the Glasgow Herald early that morning. Bonar Law, Lloyd George's second-in-command, rejected the demand as the government was already in formal negotiations with the ASE, the engineers' official trade union. An estimated 60,000 people, men, women and children, packed into the square where several rows of policemen faced them, guarding the City Chambers. Contemporary accounts describe the mood as cheerful. A deputation including Davie Kirkwood and Neil Maclean MP, went into the Chambers to meet the provost, while Willie Gallagher and Manny Shinwell addressed the crowd. Suddenly, the police attacked the strikers without warning, batoning them indiscriminately. Again, contemporary accounts talk of a frenzied attack. 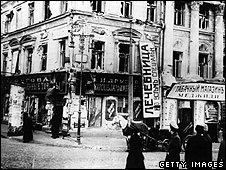 Initially driven back towards the west side of the square, the strikers rallied, and counter-attacked. The sheriff started to read the Riot Act but it was snatched out of his hand. Willie Gallagher dived at the chief constable. Kirkwood ran out of the City Chambers to plead for a stop to the violence and was promptly batoned unconscious. The fighting raged all over the square and in adjacent streets. In North Frederick Street in particular, the police were driven back when the strikers seized a lorry full of empty bottles and used them as missiles. The strikers withdrew to Glasgow Green where they were again attacked by the police, fought back, and routed them. Sporadic fighting continued late into the night in some neighbourhoods, particularly the Garngad and Govan. Gallagher, Kirkwood, Shinwell and other leaders were arrested. But Bloody Friday was in fact not all that bloody at all, especially compared with contemporary Germany or Russia. The official casualty list was 19 policemen and 34 strikers injured. In the morning, Glasgow woke up to find armed and helmeted troops patrolling George Square, machine guns on the roof of the Post Office and North British Hotel, and the six tanks parked in the Cattlemarket. Subsequently, six CWC leaders and six others were put on trial. Only Shinwell and Gallagher were convicted; the former received five months, the latter three. The 40-hour strike fizzled out, and the CWC was overpowered by the formal organisations of labour including the ASE and the STUC, which were always suspicious of the informal shop stewards movement. What are we to make of the events of Bloody Friday? First of all, the evidence is quite clear that Glasgow was not in anything which could be called a "revolutionary situation". The vast majority of the leaders were reformist, albeit radical, socialists. With the wisdom of hindsight, Gallagher was to say in his memoir, Revolt on the Clyde: "A rising was expected. A rising should have taken place. The workers were ready to effect it; the leadership had never thought of it." There is little if any evidence that any such rising was expected. Second, the riot was without a doubt a police riot. But the violent attack on the strikers has to be viewed in the context of the ruling class's paranoia about revolution in Germany and Russia. It also exemplifies its fear of any self-organisation within the working class, and its willingness to mow workers down if push came to shove. And make no mistake, that could have happened in George Square or elsewhere in Glasgow. Finally, the events of Bloody Friday were not without their lesson for the Clydeside working class. It assisted in the provision of a basic socialist education, and demonstrated that workers could achieve results by rank-and-file mass demonstration and self-organisation. Ironically, the police riot strengthened the overall working class movement in that it generated intense political analysis and discussion. And during these events, the national leadership of the engineering unions concluded an agreement for a 47-hour week, which meant that workers now started at 0800 instead of 0600, a very considerable gain. The Clydeside agitation had played a vital part in that concession.